Before you begin to alter your jump rope, make sure you have correctly sized your jump rope and marked where the new clamp should go. Choose the correct length for you. To determine your correct rope length, place one foot on the center of the rope and pull the handles up the sides of your body. If the handles extend beyond your shoulders, the rope is too long. As you become more proficient at jumping, shortening the rope will increase the rope’s rotational speed and improve your reflexes. More advanced users may choose to have a shorter rope for speed or double under purposes. Remove the cap at the bottom of one handle using a sharp flat tool like a knife. Pull the rope through to your desired length. Your box includes 2 extra clamps as well as 2 round washers for adjusting the rope. Make sure that a round washer is in place near the handle before applying the clamp. Place one clamp at your desires length and tighten with pliers. Reference the clamp that is already in place to see how it should look once tightened. Cut off the excess rope 2 inches past the new clamp position and close the cap on the handle. Before you pick up a jump rope, you must first learn how to adjust your jump rope and how to jump with correct jump rope technique. Do not make the mistake of going from "zero to hero". It's crucial to follow a step-by-step progression. 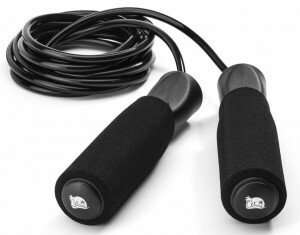 Jump rope as fast as you can without sacrificing your form. If you sacrifice your form, you put yourself at risk for injury. Gradually work your way up to 10 minutes and always stretch and foam roll (especially your calves) after your session. I know it's tempting to want to jump longer when you are first learning, but keep it under 5 minutes until you master the coordination, rhythm and timing. Avoid using chemicals to clean your rope. Use a wet rag to wipe the rope if required. For best results, do not store your rope in direct sunlight. Also, avoid high heat or extreme cold. Your rope is best stored in a room temperature environment.